Why Stay at Hôtel de la Cité in Carcassonne, France? The oldest walled city in France, Carcassonne is so perfectly preserved, it is a UNESCO World Heritage Site. 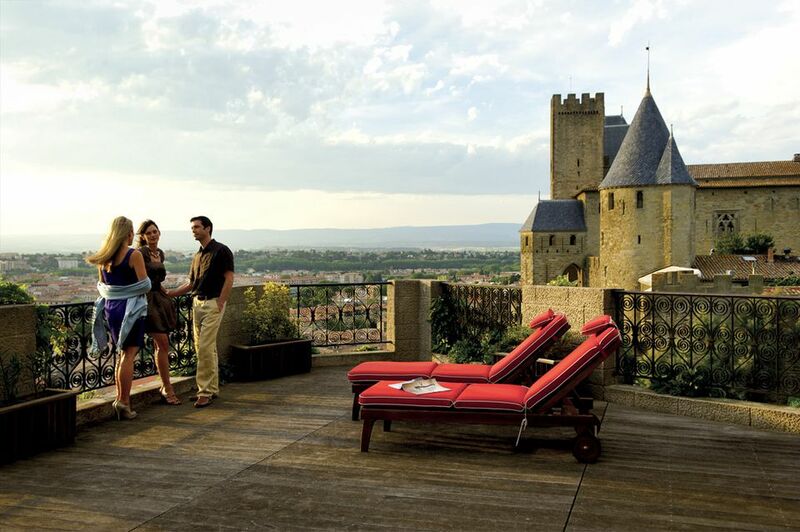 Visiting Carcassonne is a must for any luxury traveler who values history and architecture. And Hôtel de la Cité is the #1 place to stay. Why? Opened in 1906, this hotel is gorgeously neo-Gothic...and is spectacularly set within the ramparts of the medieval village of Carcassonne. Hôtel de la Cité is privately owned by a French family. The property is a member of the MGallery boutique brand of Accor Hotels, a French hospitality powerhouse that also owns Sofitel, Novotel, and other brands. MGallery hotels are small and refined, with signature offerings that MGallery accurately calls "memorable moments." Will You Like Hôtel de la Cité in Carcassonne, France? Will Hôtel de la Cité Be Your Best Choice in Carcassonne? The hotel comprises three old buildings connected by corridors. Some rooms, such as in the Tower, require quite a bit of walking and stair-climbing. Rooms overlooking the garden are quieter than those above the stone-paved street or the cafés next door. Hôtel de la Cité has 71 rooms, qualifying if as a boutique hotel. Accommodations range from 50 simply done rooms to 21 more spacious suites and junior suites. My Hôtel de la Cité tower room, number 315, had a long hallway, beautiful leaded windows, a Juliet balcony, an appealingly sloped ceiling, and an antique armoire. The hotel has no spa, but massages, facials, manicures and other services may be performed in guest rooms. The primary drawback to staying at Hôtel de la Cité is its lack of exercise facilities apart from a smallish outdoor swimming pool that is open seasonally. Hôtel de la Cité offers exceptional classic and Southwestern French cuisine to guests and other visitors to Carcassonne. Breakfast, included in room rates, is a highlight of a stay here. The breakfast space is Chez Saskia, in a millennium-old stone building next door. The hotel's fine-dining restaurant, Le Donjon, possesses the only Michelin star in Carcassonne. Hotel de la Cité is committed to introducing its guests to the exciting wines of its Languedoc-Rosillon regionc. Guests can sample these local quaffs in the hotel's restaurant and in La Barbacane, its wine bar. As is common in the travel industry, the Luxury Travel Expert was provided with a complimentary visit in order to describe the hotel. For more info, see our Ethics Policy.